Over the course of my career, my design process has evolved from an intuitive “this looks cool” approach to a more strategic one that puts the user at the center of the process while aligning with business needs. Relatively speaking, this is a fairly new development for businesses to embrace, but thankfully its adoption and benefits are on the rise. Having a process, knowing how to speak to it and illustrating its value are skills every designer should have today. I’ve worked as a Visual Designer, Art Director, UX Designer and Design Manager, both in-house and agency-side and have adapted my process to fit my roles. I have picked up tools from coworkers, mentors, workshops, and conferences; all of which have inspired me to take a closer look at my process. 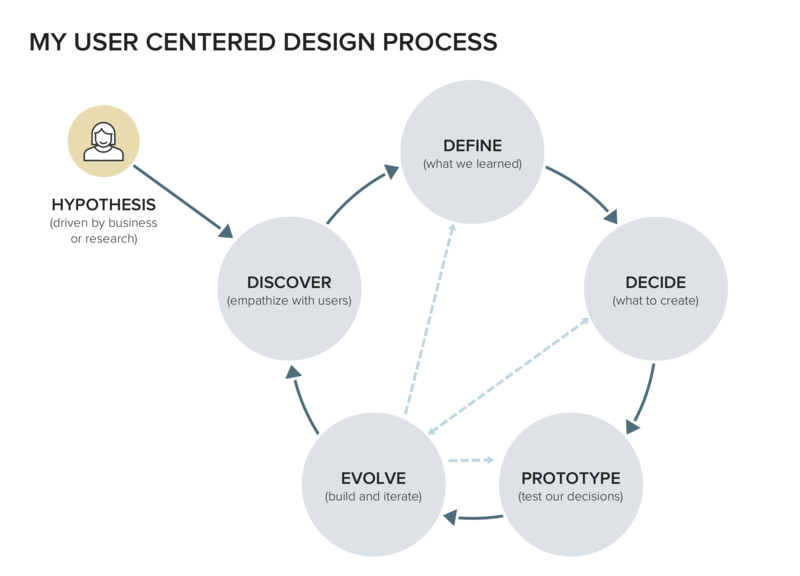 Having studied models and theories of User-Centered Design (UCD) at Northwestern University, I feel I am in a better place to articulate my process, and its value for myself and any organization I am working with. IDEO is a leader in the Design Thinking and UCD space. Their process has 3 broad phases; Inspiration, Ideation, and Implementation. Their model is widely adopted and core to many designers approaches. They also put forth that products must be desirable to the user, viable for the business, and technically feasible to build. This insight helps guide my product solutions every day to ensure what I’m building will be adopted and successful. For my current process, I have combined what I’ve discovered with my hands-on work throughout my career and recent studies. I also rely heavily on what I’ve read around best practices in Design Thinking and UCD methodologies from IDEO, Google Ventures, and the Stanford d. School. The diagram below is my remix. It is my interpretation of the UCD process displayed in a linear fashion. 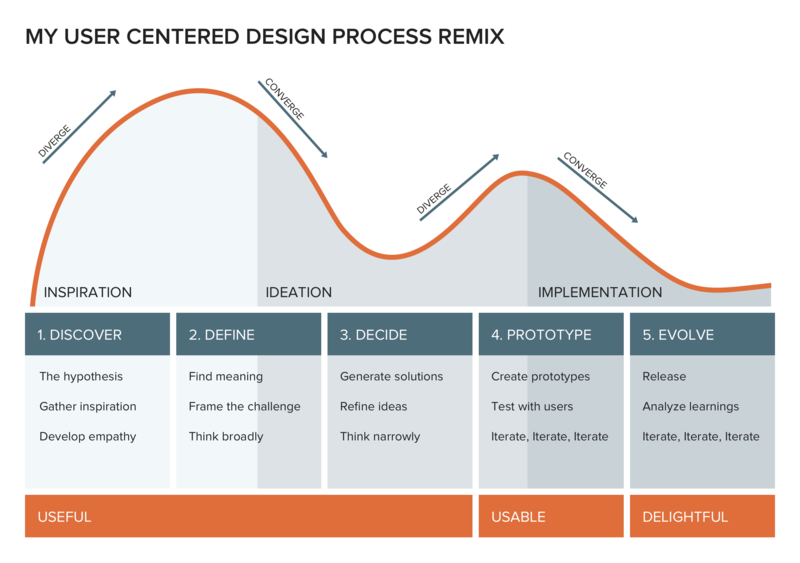 I use IDEO’s 3 phases of Inspiration, Ideation, and Implementation as a guide over a more detailed 5 phased approach. In my process remix, I chose Discover, Define, Decide, Prototype, and Evolve. I overlaid a chart to show how thinking diverges and converges during these phases as you arrive at a solution. A project should begin with a hypothesis that has come from stakeholders or existing research. In the Discover phase, we use that hypothesis to guide the research as we empathize with our users, get inspired, and think broadly. The Define phase is where we find meaning from the patterns that emerge from our time with our users. It’s a place where all ideas are on the table, no matter how far out they might be. Ultimately, we’re able to frame the challenge and converge on a point that takes us to the Decide phase. Here we start to generate solutions and refine our ideas, making sure that we’re thinking narrowly enough to effectively address the challenge in front of us. Once we have made a decision on an approach, in collaboration with stakeholders, we enter the Prototype phase. Prototypes get created at varying levels of fidelity. Depending on the skill-sets of the team and time in the project, the prototypes can be anything from sketches on paper, static click-through wireframes, to fully coded products on devices. We test our prototype with users and iterate based on feedback we receive. From there we Evolve. We iterate and analyze what we learn from our users to keep releasing the most valuable solution possible. The process does not end at release. It should remain in a constant state of evolution based on analytics and user feedback. The bottom row of my chart highlights an important point. 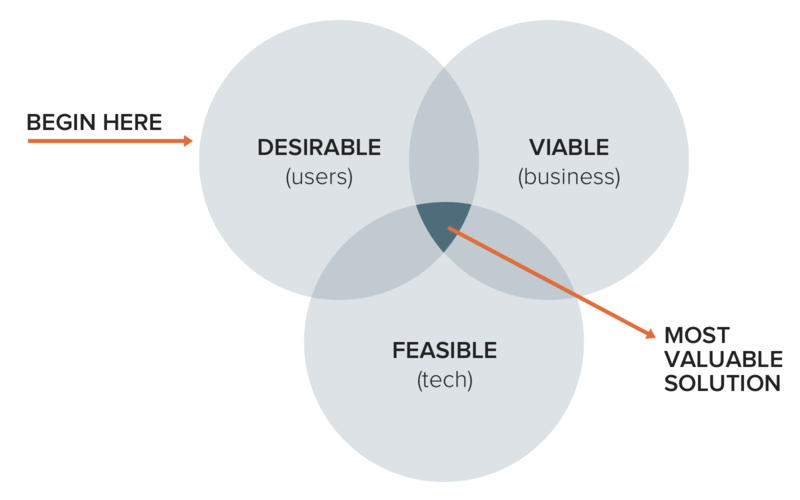 In the beginning 3 phases of the UCD process, we collectively define what is useful for users. If a product isn’t useful, it won’t get adopted. Yet, often times, designers are brought into projects at a later phase, not taking advantage of our full value. Bringing UX into a project in the later phases to make it look better based on a stakeholders intuition will not improve the usability of a product, and it will definitely not address your users needs and desires. When you skip the beginning phases of this process, you drastically reduce the ability to make a product usable, let alone delightful. Now keep in mind, this process is rarely linear. The graphic below illustrates how the process is more cyclical and has many jumping in and out points. Having started my career in Visual Design, I feel it is also important to document that process as well. UX Designers work very closely with Visual Designers, and sometimes even jump between roles like a beautiful unicorn. It’s important to document the Visual Design process as well so that we have a harmonious, shared understanding of each other. Below is a diagram showing a process I recommend. 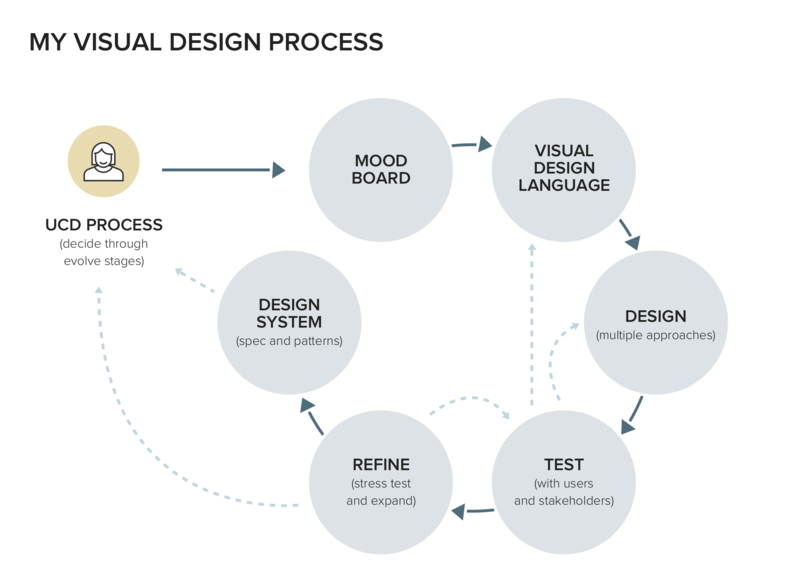 The Mood Board and Visual Design Language phases can start as early as the Discover Phase on the UCD side, but I find it to be most effective to hold off on visual design mockups until we arrive at the Decide Phase. Going high-fidelity too quickly is unnecessary and can create needless spin, wasting time and money. These processes are my ideal approaches, and what I can bring to every project I take on. Yet, sometimes it’s just not possible. There can be pushback from clients saying it’s too expensive, or the business needs to quickly get to market to hold off a competitor. That is the world we live in and could is a topic for another story. Use this approach as a guideline until your organization or client are on board to support the full process. Keep in mind this is not a take it all or leave it scenario, but it will greatly increase the chances of success for your product if you do as much of it as you can. As designers, it is our job to be flexible and our goal is to inject these methodologies wherever we can to produce the best outcomes. 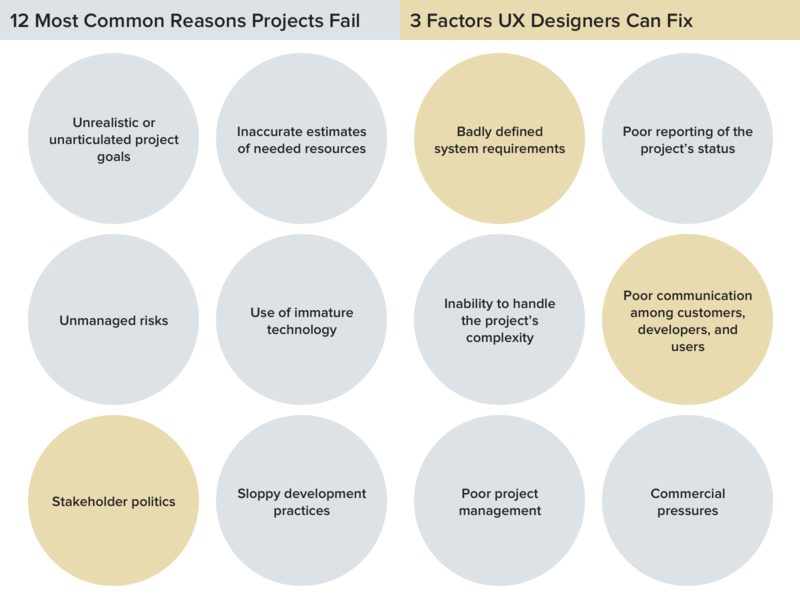 Weinschenk goes on to cite a study done by the IEEE Spectrum that shows 3 of the top 12 reasons software development projects fail can be prevented by following a user-centered design process. Another fascinating study, done by the Design Management Institute (DMI) and consulting firm Motiv Strategies, shows that over the past 10 years companies who invest in design are beating the S&P by 228%. Facts like these showcase the value of following a UCD process and will help you gain stakeholder buy-in. This is my high-level process mashed-up from various professional experiences, brilliant co-workers, and institutions. It has helped me execute on many projects and will guide on much more.